The smartphone is the world’s most ubiquitous device. It’s the once piece of tech gear we bring with us everywhere. Addictively intimate, we spent more time on these tiny appliances than is healthy. The reason we keep coming back to the smartphone is its versatility. But just because these handsets can do it all, that doesn’t mean they can do it all well. 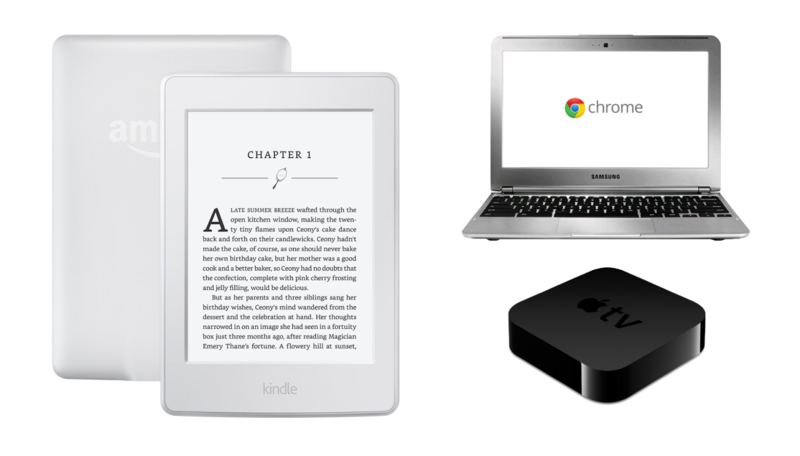 The _____ in question could be an E-Ink eBook reader, with their weeks-long battery life and frontlit, easy-on-the-eyes displays, a Chromebook (proper desktop browsers FTW) over a tablet or phone for productivity and web browsing, or a set top box (such as the Roku or Apple TV) in place of the poorly aging and lousy built-in apps on a smart TV. The same way a doctor can make more money if he or she specializes in a particular field of medicine, a user can get more out of the digital world by having a designated device for each of their major habits. "Users can get more out of the digital world by having a designated device for each of their major habits." Take the Samsung 4K smart television as an example. Really what is appealing about the product is its display; that’s why people purchase TVs. Potential buyers aren’t hooked at “it runs Tizen.” They likely don’t know or even care what Tizen is. That Netflix runs on the TV is table stakes; everything runs Netflix. What is far from a given is how well smart TVs run Netflix and other apps. More often than not, the answer is poorly. Does the Tizen version of the app support 4K? Is it decoded locally or on the server side? How about the WebOS version of Netflix? (LG smart TVs use WebOS.) For the layman, it’s anyone’s guess because that information isn’t easily accessible. The best solution in the 4K smart TV example is to bypass Tizen (or WebOS or insert proprietary television operating system here) entirely and get a Roku 4K. If it were an LG 1080p OLED, then an Apple TV would be best. Either way, shelling out the extra $129-$149 is well worth it to get the most out of your $2,000 purchase. The Roku and Apple TV platforms are more robust and have better support and performance. Heck, original Rokus and last-generation Apple TVs are still supported and, in most cases, perform better than the software pre-loaded onto even the most expensive smart TVs. The lay of the smart TV land is a microcosm for software and services as a whole; what comes out of the box is rarely, if ever, the best experience. Do you read a lot of eBooks? Buy a Kindle, Nook, or Kobo. Do you stream Netflix, Hulu, etc. using your TV’s default software? Strongly consider a set top box. Frustrated by your Galaxy Tab’s mobile web browser? Get a Chromebook. No one device can do it all, and those who try to save a buck by having their iPad be their laptop have only themselves to blame when they try to use a wireless mouse.